Recently started learning to turn pens and realized it tougher than it looks and a lot of variables but I’m learning. 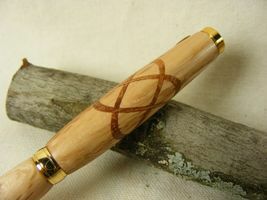 Here is a red oak pen with a walnut Celtic cross and corian insert on the top and bottom the upper tubes. Anyway here it is and thanks for looking. I am sure it would be difficult for me. I have not learned turning yet. Nice pen and welcome to the obsession of segmenting. Segmenting is a ton of fun and even though the canvas that you have to work with is small, there is just an endless amount of things that can be done with it. I am sure you realize the mistakes you made while doing this and you will learn as you go. It is a good first start. One note if you are going to do slimlines with knots you may want to stretch the knot out by using 60 degree cuts instead of 45. When you turn down that small diameter you lose the details. Just a note. Take care and keep them coming. I agree on the 60 degree knot. Here is a link to one that I turned using 60 degrees. It’s amazing how much shorter the knot gets as the blank is turned down to size. Yes this knot thing was a bust cause it got too small plus I had used a wider table saw blade to boot. Segmenting is a lot of fun but a lot to learn as well. So I was wondering how you get the 60 degree cut on a miter saw. Can you cut a 30 degree cut on a board and use it behind the board you cut and do another 30 degree cut? Reason I ask is I did the knot on a table saw sled with a 45 degree block to get the cuts for the knot. Again its a learning exercise with the hopes of doing something like all you pro pen turners. I use a sled on my bandsaw for a thinner kerf. Don’t know about the miter saw. as far as I know, you cut 30 degree. when you mate 2 pieces cut at 30 degree the resulting angle is 60 degree. You might also look at the 7” skill saw blades that are now being made by a couple of mfg’s. At Home Depot I’ve bought 2 blades in a package for $7.95. These blades are only 1/16” thick which is close to bandsaw blades with clean sides. On my Grizzly saw I can cut 1 5/8” thick wood with the smaller blade.